Checked on the bees this weekend. They all seem to be doing great. Have one hive though that never seemed to get off the ground this spring. You can see it in the middle of the picture of the whole bee yard just to the right. It is the one that is still a single deep. So, came up with a plan for it. I am going to pull the queen and a couple of frames of brood then put it in a nuc box to keep the queen, that way we can have a queen for observation hives. I will then drop two new frames of brood into the box from one of my good producers. The MHs seem to be doing very well with the honey and they are also fairly gentle, hmmmmmmm. I think we are now somewhere in the neighborhood of about 400lbs of honey!!! Wow, it will be nice to have all of that to share with all of you this year. After I was done checking on the hives and snapping pictures of the apiary, I went over by the kiddie pool that i setup for the bees to gather water. Picture is at the right. There were a lot of bees getting a drink there... Yea!!! I am so glad they have easily adopted the "watering hole" I created for them. I have another kiddie pool too, but at present it seems to have a leak. Hopefully, I can fix that this coming weekend. Speaking of this weekend, we are looking to extract some of that fine Ozarks honey this weekend too. Hopefully, we can pull some off the hives and start bottling to sell. Well, just incase we needed a subtle reminder of either one, today gave us just that. Well being the day after Mothers Day and being the favorite son (Ok, so I am the only son, but shhh, dont tell my mom), I thought that I should take my mom to lunch. Now, before you go acusing me of being a day late, you need to understand that she was out of town yesterday. So anyway, we are having lunch when I get this swarm call. Sounds like the perfect storm, er, swarm. It's about the size of a basketball and about five feet off the gound on a young maple tree. So I am very excited. I call Jeff and let him know that we have a live one... He gathered up his equipment and headed that way. Unfortunately, when he called to double check on the way they were already gone. 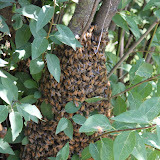 You can see from the pictures that this swarm was just beautiful and looked to be very easy to catch. Oh well, better luck next time. 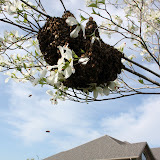 This might be a good time to remind everyone what areas we cover for swarm removal. Well, the bees were a big hit at Classical Conversations (Liv's home school). She got up and sang the whole 1st verse and chorus to "I'm In Better Hand's Now". It was just amazing! I am so proud of her, she said, "well, I was a bit nervous dad, but I just sang anyway." How awesome, spoken like a truly beyond her yeas 5yr old. Tracy finished up the song, while Liv did her own "interpretive" dance to the music, then joined back in on the final chorus. It was great. Then we talked about the family bees. It sure is fun telling everyone that we have over 1/2 a million bees. The questions are always so fun to answer. It always impresses me how much people know about bees, but I must admit, the parents at CC were especially "in the know." If any of you are reading this, you certainly do your homework when it comes to all natural ingredients, like honey. Although it wasn't the reason that we took the bees, I think that we have several new customers from the presentation. Livy sure enjoyed showing "her" bees off to her friends, and they loved checking them out just a much. It was a very fun time. Lots of compliments and questions. Stopped by the Home Depot on the way to the house and they had 6~8' Japanese Maples on sale for $80. So, of course we had to go and get one. But first I had to get all those girls back into the hive. It was so nice, Tracy cme to help me. I really liked that! She has been showing more interest in the bees and wanting to learn about taking care of them. So, I was really excited when she asked if she could go over to the hives with me while I put the frame from the observation hive back in. I am going to have to get her suited up soon, so she can look down in a hive while I do an observation. Where is the queen? Well, after looking for her yesterday in the parent hive of the split and not finding her. I can only assume that she either left with a swarm, or is in the nuc that I made from the hive. As it was getting late in the day and we needed to go if we wanted to purchase that tree. I quickly put the frame back into the hive and will have to check on the split tomorrow.